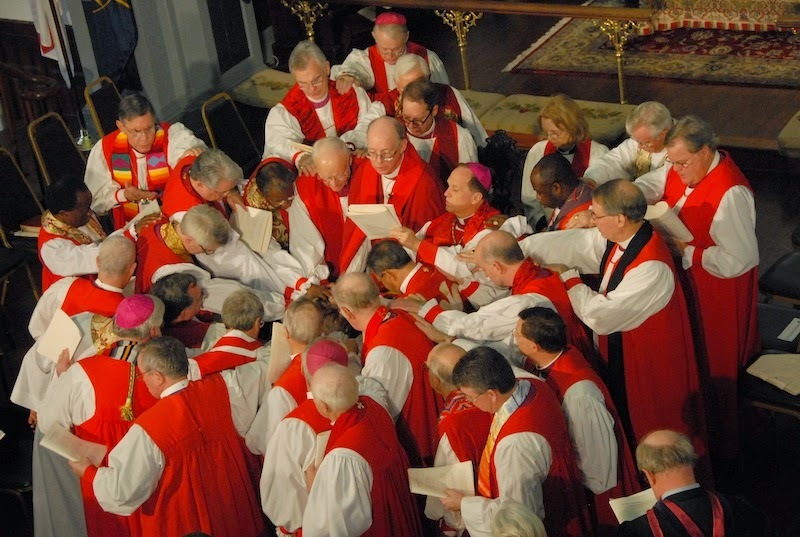 On Saturday, the Episcopal Diocese of Massachusetts will gather to consecrate the Rev. Alan Gates as our new bishop. There's great excitement about this, especially at my parish since Father-soon-to-be-Bishop Gates served as our curate from 1987-1990. And, yes, I've already told him that if things don't work out, he can have his old job back. This will only be the second consecration I've ever attended. In 1998 when our seminary dean, Mark Sisk, was elected Bishop of New York a rag-tag group of us seminarians from Seabury-Western in Evanston, Illinois, flew east for the festivities. We were thrilled to be included in the procession and it was surreal to see someone we had grown close to be made a bishop in front of over 3,000 people packed into the Cathedral of St. John the Divine. Of course they stuck us in the back of the (very long) procession and by the time we got to our seats, I'm pretty sure the service was about half over. 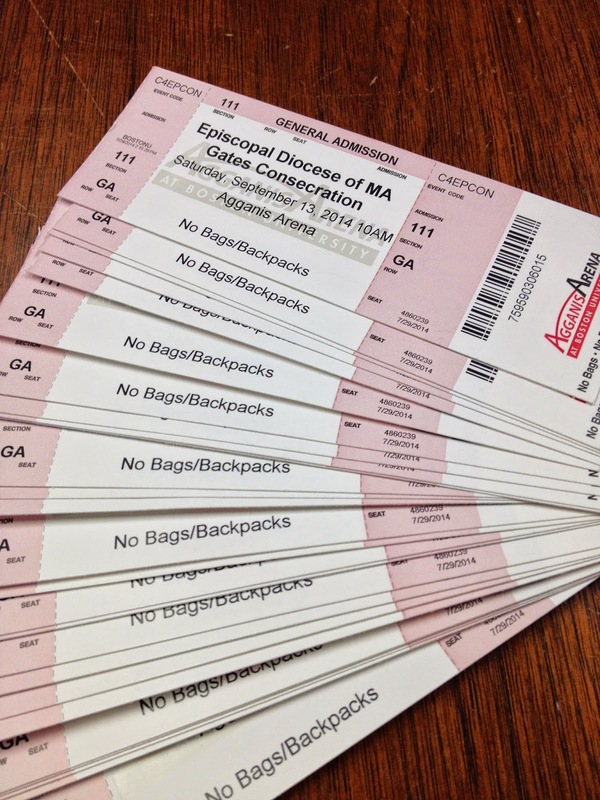 Since there's no Episcopal institution in Boston that could possibly hold thousands of rabid church goers, the consecration will be held at Boston University's Agganis Arena. Some people think it's unfortunate we can't hold this in an actual church but as Americans we've been "worshipping" in sports arenas for generations so what's the big deal? Plus this is the closest thing we have to channeling Joel Osteen so I suggest we just sit back, relax, and pretend we're relevant enough to have a mega church. But I digress. What I really wanted to do was be of service to the throngs attending the upcoming consecration. Thus, I've created a Consecration Packing List to make the day more meaningful for everyone involved. 1. Smart Phone. This is so obvious, I almost didn't list it. The only question is what will run out first, your battery or the communion wine. Eucharistic Prayer, I suggest coming loaded for bear. With bear jerky and other healthy snacks. 3. Flask. Just in case there's liturgical dance. 4. Red Spray Paint. Despite all the announcements you know there will be several priests who show up wearing white stoles instead of red ones. A quick spray and the problem is taken care of. 5. Oxygen Tank. Just in case you get stuck in the nose bleed seats. 6. Drone. Since it will be hard to see the actual laying on of hands with the expected 28 bishops in attendance, your camera-equipped drone will give you the perfect bird's-eye view. 8. Bic Lighter. Just in case the Baby Boomers in charge of the liturgy dim the lights and try to turn things into a glorified Air Supply concert. 9. Extra Tickets. Yes, they are issuing (free) tickets for this extravaganza. Plan on bringing extras to scalp thereby eliminating the need for your fall stewardship campaign. 10. Gratitude. Be thankful that you're not in charge of pulling this off. Or that you were elected bishop. If you are interested in watching the live webcast of the consecration, you can click here on Saturday starting at 10:30 am. Or you can follow it on Twitter with the hashtag #diomass (at least until our phones die). In the meantime, please keep Bishop-elect Gates and his wife Tricia in your prayers. It's a big job with a multitude of often conflicting expectations, hopes, and dreams from the various constituencies across the diocese. Yet it's also one with great opportunity to inspire a generation of faithful Christians. May the mantle of leadership be a good fit for all involved. Since this is church-in-an-arena, there is probably no church-lady-catered lunch afterwards. I suggest a Consecration Tailgate Party. After the main event, head for the parking lot, break out the radio, the lawn chairs, the cooler, the bratwurst on the portable barbie. Go Episcopal team. I am reminded of a diocesan big-anniversary mega-service held in a sports arena. The logistics of getting communion wafers up to the nosebleed seats didn't work out so well so the priests who were tasked with manning those stations bought some pretzels from the snack bars (which were open), consecrated, and distributed. 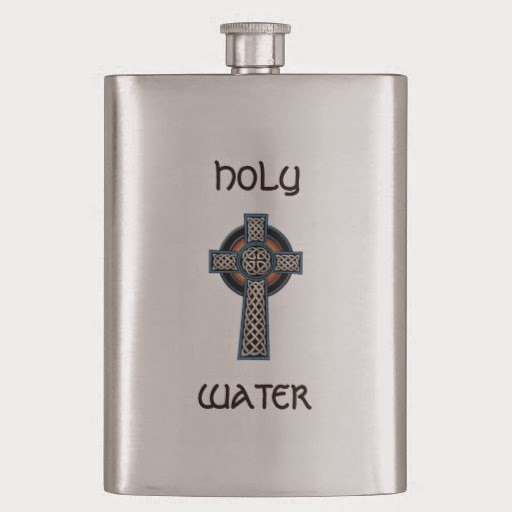 I'm assuming you will have Water of Life in the flask. And, if Bp. Nedi Rivera is there, you can expect dancing. Great article. 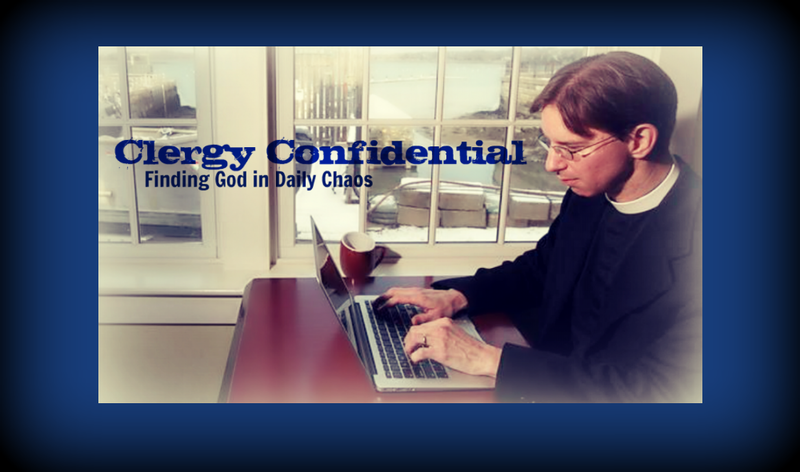 I really enjoy reading your blogs and have followed Lent Madness for the past several years. This year my parish was involved for the first time! Thanks for all the work you do!